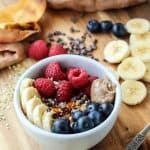 A Whole30 breakfast bowl packed with protein, complex carbs and healthy fats. Use your choice of protein for a vegan-friendly option. Flesh out sweet potato if not done already. In a small bowl, mash sweet potato with fork. Stir in protein powder until combined. Layer in banana slices, raspberries, and blueberries. Top with additional desired toppings and dig in! You can enjoy this bowl warm or cold, your choice! *I use collagen peptides or egg white protein powder for a paleo, Whole30 compliant option. But you can use your choice of protein–plant protein, whey, etc. -Nutrition approximate, calculated with collagen peptides and no additional toppings.